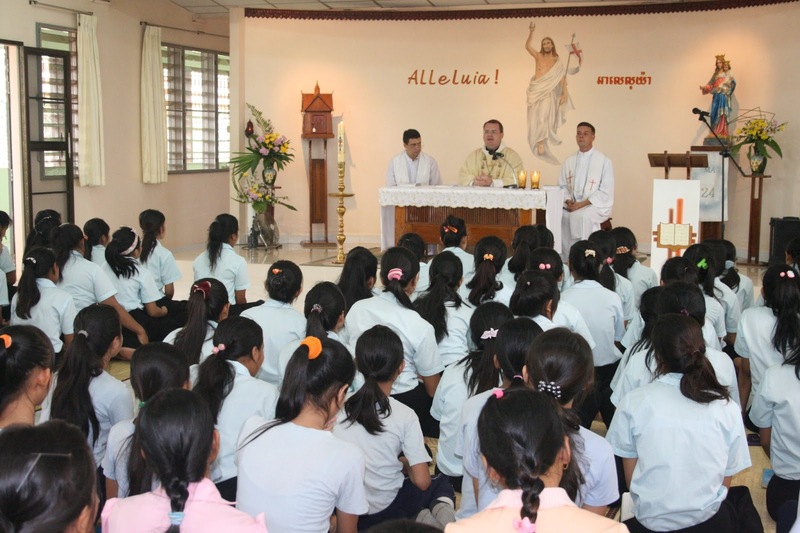 Truly, for all of us, this is a time to give thanks at our Don Bosco School in Teuk Thla. After many years, sacrifices, planning, designing, discussions and receiving generous donations, finally we celebrated ground-breaking day for new Don Bosco Middle and High School. Celebration took place in the end of April and the sound of machines started in June. Before this some generous parents came one Sunday to cut down the banana and coconut trees. This good news probably has already reached you. Last week our students helped to clean the place of all the grass weeds and stones. They were happy to walk up and down the land, where their school is going to be built soon. This is their hope and their joy, fount of knowledge and education to true values. In the morning of 24th April the sun hid itself, as if knowing that the big crowd of children and guests needed to be protected from the heat. The special guests were: Monsignor Olivier Schmitthaeusler, Bishop of Phnom Penh, friends from Japan, some priests, sisters from Toul Kork community and most of all, a big number of 580 students from grades 1-7, all the teachers and other school staff. The smallest ones-the Kindergarten children- knew as well that something big was happening on the other side of the fence and at one time they too united their voices with the bigger one singing. That day all were smiling! 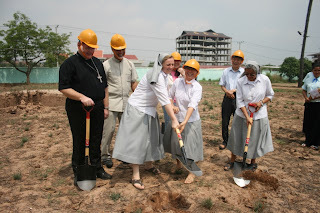 After the initial program, children said their prayers: for all the donors, construction workers, those who will teach and study in the new school and also for the sisters and those who knew how much courage and sacrifices were put into this new beginning. 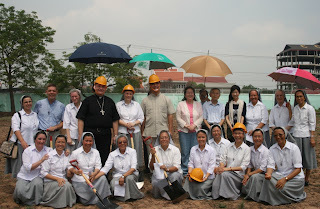 Bishop and priests went all around the compound to bless the land. A special stop was made under the tree that holds on its branches the statues of Mary Help of Christians and St. Joseph, to whom we pray every day for this big project. By the time we came to the end of the ceremony everyone was smiling, St. Don Bosco and St. Joseph smiled too from heaven and the sun came out from behind the clouds. These days the last formalities with the construction company and government permissions would be coming to an end. Then, we’ll expect to hear the noise of trucks and machines for the piling work. Although disturbing, it will be like a gentle melody of the future … Growing slowly, but steadily.